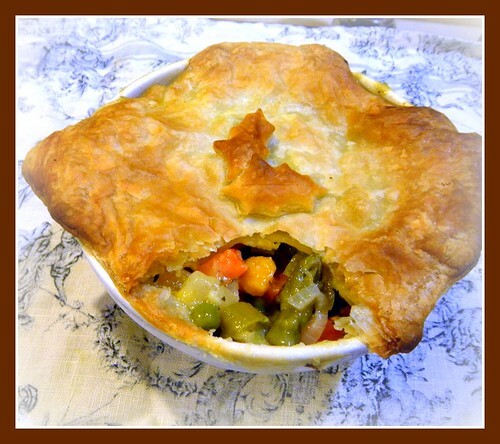 Fresh leeks, asparagus and butternut squash takes this pot pie up a notch or two from your everyday pot pie. Melt the butter in a large pot over medium heat. Add the onions and saute 5 minutes. Add leeks, garlic, and white wine and saute until translucent, 5 minutes more. Add the flour, reduce the heat to low, and cook for 3 more minutes, stirring occasionally. Slowly add the stock, salt, and pepper, and bring to a boil. Simmer for 5 more minutes, stirring occasionally. Add the heavy cream and season to taste. The sauce should be highly seasoned. Thaw puff pastry and roll on a floured surface so that you have enough to cover your bowls/baking dish. Divide the filling equally among 4 ovenproof bowls or one large casserole dish. Divide the dough into quarters and roll each piece into an 8-inch circle. Brush the outside edges of each bowl with the egg wash, then place the dough on top. Trim the circle to 1/2-inch larger than the top of the bowl. Fold dough over the sides, pressing it to make it stick. Brush the dough with egg wash. Place on a baking sheet and bake for 1 hour, or until the top is golden brown and the filling is bubbling hot. Check on the pie(s) after 30 minutes and if the puff pastry is getting too dark, cover with foil.